AMETEK, Inc. is a leading global manufacturer of electronic instruments and electromechanical devices. AMETEK has over 15,000 employees at 150+ manufacturing locations around the world. The company, with 12 divisions and business units, serves the Aerospace and Defense, Connectors, Metals and Engineered System & Materials, Electronic Instruments, Motors and Blowers, and Power markets. AMETEK was contracted by Lockheed Martin to design a portable flight suit chiller unit for the Joint Strike Fighter (JSF) program. This system works with a pilot cooling vest to maintain a pilot’s deep body core temperature at ≤ 100.4° F (38° C). The JSF program aims to deliver affordable, next-generation striker aircraft weapon systems for the U.S. Navy, Air Force, Marines and allies. Pilots flying these aircrafts are subject to high levels of acceleration – up to 9g – and must wear G-suits to prevent blackouts. To prevent pilots suffering from heat stress in the cockpit and on the ground, portable flight suit chiller units are needed. The individual cooling equipment (ICE) has four components: a charger, a Li-ion battery, a battery, and a fluid charger. The Personal Cooling Unit (PCU) interfaces with the cooling vest and delivers the cooling fluid. It uses a vapor cycle cooling circuit and receives fluid from the cooling vest, which transfers the heat load extracted from the pilot. The system has multiple control loops. One regulates the fluid-out temperature and the compressor speed to achieve a specific temperature setting. Another monitors the temperature difference over the evaporator and controls the refrigerant flow. Part of the design challenge is monitoring the multiple variables and developing the code that goes to the controlling device to make those adjustments automatically. The chiller unit must also run within its power limits to prevent damage. Working under a tight schedule, Godfrey and his team decided to follow a model-based development (MBD) approach - leveraging Embed. 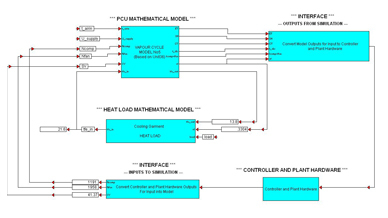 Using Embed, the team created a working model of the combined chiller unit and control system via a block diagram approach. They correlated and refined the plant model using measurements of plant responses in the lab. Then a multi-loop PID controller was built with interlock safety stages that stepped through the start-up and shutdown actions necessary to avoid damage to sensitive device components. After debugging and tuning the controller in offline Embed simulations, an ANSI C code from the controller model was created automatically. Then the code was compiled and downloaded directly to the Texas Instruments (TI) C2000 target chip, using a bi-directional Joint Test Action Group (JTAG) link. Engineers tested the control algorithm firmware running on the C2000. It resides in the Embed plant model running in real time on a PC, using JTAG technology to easily provide an interface between virtual plant outputs supplied to the firmware and firmware control outputs supplied back to the virtual plant model in Embed. When engineers were satisfied with the embedded controller’s behavior, they replaced the interactive JTAG input/output (I/O) ports with Embed blocks for analog-to-digital converter input, general-purpose I/O, pulse-width-modulated (PWM) outputs and custom hardware sensors. They generated ANSI C code from the controller model, downloaded it to the TI target and ran it against the Embed model in real time. At this point the controller was electrically connected to the Embed virtual plant. This implemented “hardware-in-the-loop” (HIL) testing. Development of an embedded control system for a chiller unit under a very tight schedule and high safety standards. Employing a model based development approach leveraging Embed. One environment for plant modeling, control design, code generation and validation. Block diagrams drove code generation and were linked to requirement documents. Quality assurance through model-in-the-loop, processor-in-the-loop, and hardware-in-the-loop testing. 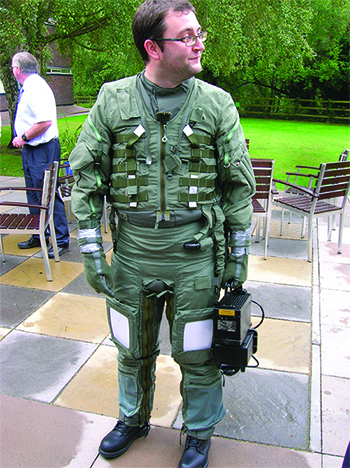 Above: Pilot flight suit with AMETEK’s personal cooling unit (PCU). With the verification level complete, the controller firmware was run with the hardware plant. Each subsystem was vigorously tested employing the established design-simulate-validate procedure. The testing was key to apply to the Safety Evidence Assurance Level (SEAL) standards of Lockheed Martin. Bi-directional hyperlinks to the requirements documents were placed in the Embed diagram with hyperlink-enabled label blocks. Compound block coloring was used to track validation progress. Embed data export with automatic source diagram and time stamp served as evidence of validation of implementation in meeting the SEAL requirements. With Embed, the code for all the peripherals was created, handling interrupts and scheduling tasks automatically from the graphical diagram. The Engineers were able to iterate and optimize the code. AMETEK was very pleased with its MBD process and Embed's contribution to it. According to Godfrey, “One of the advantages of Embed is that you are not directly coding in C. You are employing a diagram and using the automatic code generator to create the code.” He explains that if the automatically generated code proved too long, for example, he could go back and easily optimize it for efficiency. “Embed allowed us to model the system and be confident about our design before committing to any hardware,” he added. “The software guided us in the right path to take and sped up development.” When it came to the verification and validation exercises, the software allowed code segments to be individually tested and the results logged. Moving forward, AMETEK plans to use the model-based development process on other projects. For example, it will leverage its work in embedded processors on an armored fighting vehicle for Spain, an underbelly camera for a Turkish aircraft and a fan control for a Canadian vehicle. 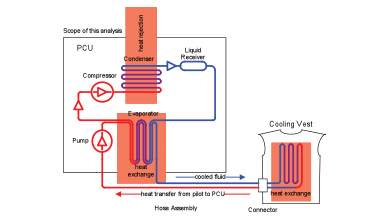 Schematics of the cooling system. Example diagram for hardware-in-the-loop testing. AMETEK, Inc. is a leading global manufacturer of electronic instruments and electromechanical devices with 2015 sales of $4.0 billion. AMETEK has over 15,000 colleagues at more than 150 manufacturing locations around the world. The company, with a dozen divisions and business units, serves the following markets: Aerospace and Defense, Connectors, Metals and Engineered System & Materials, Electronic Instruments, Motors and Blowers, and Power.